Having spent way too much time this morning talking about how Ken Kesey’s IH bus Further inspired endless VW bus Mini-mes, here’s the ultimate mash-up of the two, even if the International is a bit to modern. These VW-bus topped hippie buses were something of an icon, and I had long suspected there had to be one in town still. Sure enough, I found a couple of days ago, by taking a wrong turn. No, wait; a right turn. It’s in a driveway, so my shots are not ideal. And the International Loadstar bus is rather a short one, its body barely longer than the VW bus. Looks like a Wayne body on that Loadstar…I’d date it to 1965-67 as the parking/turn signals below the headlights disappeared by ’68 or so. I don’t envy this guy on window cleaning day. 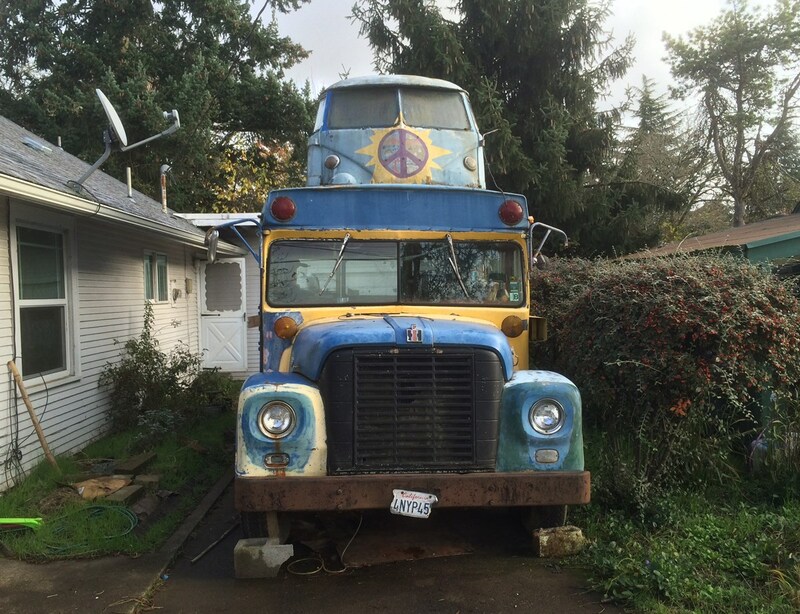 Old hippie vehicles should be a category at Pebble Beach. It’s all fun and games until this guy has to go under a bridge with a low clearance. He should paint ‘Even Further’ on the top. This would be such a fun thing to own and work on and take trips in. The paint would be a never ending project. Perhaps, like that Rambler, he should invite passerby to paint on it. I’ve seen this bus several times … back when the Dead were still on tour, it would appear during the annual concert in Chicago. This beauty would park down the street from my apartment in Bucktown (back when it was a ratty neighborhood) along with a group of other, similarly ingenious combinations of vehicles that I think did nothing but follow the Dead on Tour. If only Joseph Dennis had been in the neighborhood then, we’d have a picture…. Way cool, I may have seen this bus as well. I remember seeing a Bus/VW combination like this after dropping my Sister and BIL off at at a Dead concert many years ago. No, I didn’t go. Probably should have, but I just don’t like their stuff. I have made several attempts to do so, maybe I’m not medicated enough? P.S. You know that their ‘sound man’ Owsley, drove a Studebaker Truck, yes? Someone pulled it out of a barn about six years ago. I’ve seen that bus on the internet I believe. Is there gas in the bus? Yes there’s gas in the bus! Used to be a VW microbus. Now it’s a VW megabus. It does my heart good to know there are still pockets of this in Eugene. I lived there when Jerry Garcia died. The shock and grief couldn’t be cut with a knife; it’d’ve required a commercial-duty chainsaw. I remember when these conversions were hear and there, every where . Once in a while a VW Beetle would get welded to the top of a Dodge Van or other silly thing . IIRC there’s one of these sitting patiently in Randsburg, Ca. 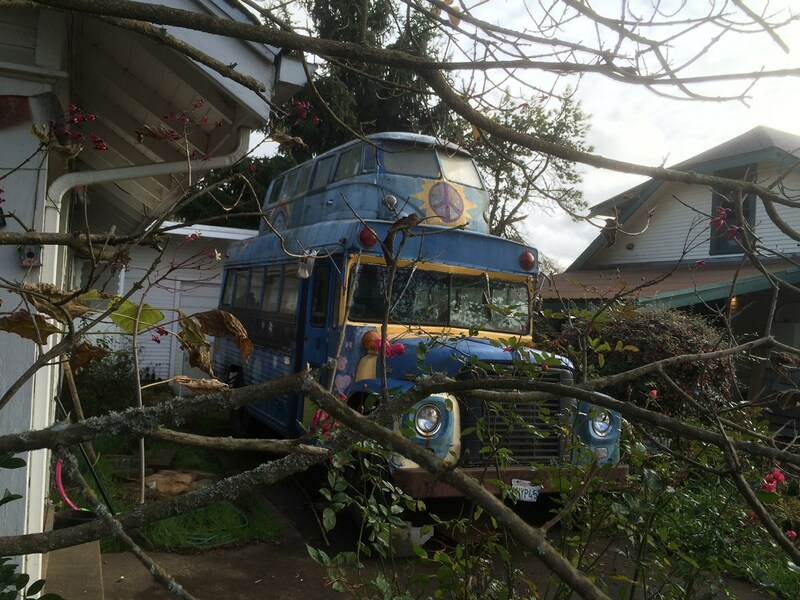 , not abandoned or anything like that ~ owned by an interesting guy who talked to me about his other old school buses . There is a full sized school bus with half of a VW bug and bus welded to the top of it. I’ll have to see if it’s still around. It went to a lot of VW shows in the early aughts. That’s a great find – looks like one could no doubt still get high just by taking a few deep breaths from 15 feet away…. 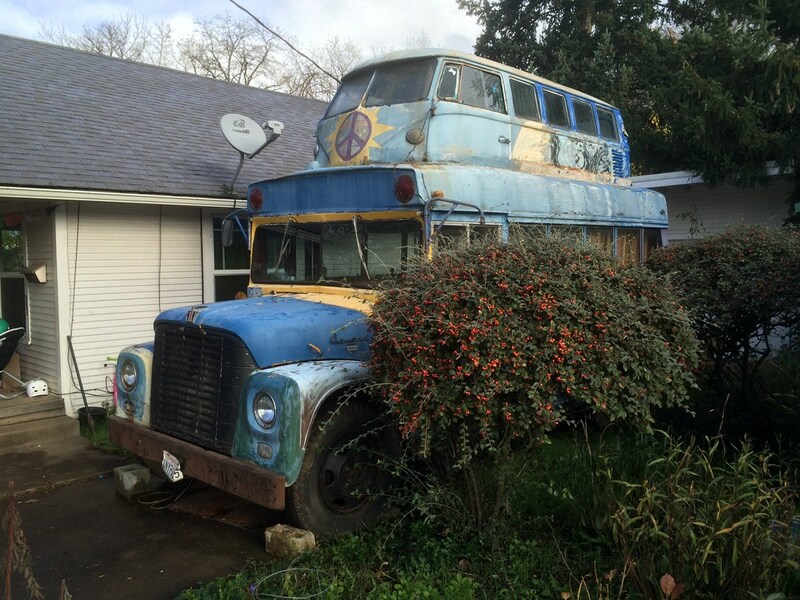 You can ride the short bus, or you can ride the top deck of the short bus…. Wow–cool combo. The school bus I rode in third through fifth grade was one of these International Loadstars, a ’79 with a Thomas-built body. Not a short one though, and conspicuously missing the VW extension and the psychedelic paint job!